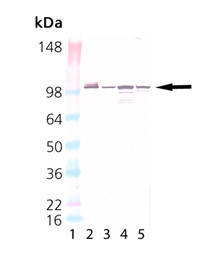 Application Notes: Detects a band of ~98kDa by Western blot. Scientific Background: Grp94 (Glucose-regulated protein 94) is an abundant resident endoplasmic reticulum (ER) lumenal stress protein, which together with cytosolic Hsp90 belongs to the Hsp90 family of molecular chaperones. Grp94 expression is upregulated by stress conditions such as glucose starvation and heat shock, which promote protein misfolding or unfolding. In addition to a homeostatic role in protein folding and assembly, Grp94 can function in the intracellular trafficking of peptides from the extracellular space to the MHC class I antigen processing pathway of antigen presentation cells. Immunohistochemistry analysis of human spleen tissue stained with Grp94, mAb (9G10) at 10µg/ml.